I'm on a roll! The Guerlain counter at Bergdorf Goodman had the entire Guerlain Terra Azzurra Collection in (and available for sale, more info on this at the bottom) and I was able to get swatches. I'm beginning to understand why Karla Sugar gets such a kick from swatching. It's so much fun to see the entire collection at one glance. It definitely also helps me pick out the items I really want. I mean, I knew I want the purple gloss and mascara as soon as I saw it. I think the bronzer looks generic, but it's not going to stop me from getting it because I have a weakness toward Guerlain powders. I think the coral shade from the eye quad is great (if only it were a blush!) but I know I won't be able to use the pink, so that's a pass. The purple khol looks amazing, which is a pity, because it'll probably last two seconds on my oily lids/watery lashline and I wish I hated it so I wouldn't be tempted to get it. The entire Guerlain x Pucci Terra Azzurra Collection is already available for sale at Bergdorf Goodman. You can order through Dustin Lujan at 212.872.8612, or if you would like to speak to a Guerlain specialist, you can try Alberto at 212.872.2734. Tell them I sent you! Bergdorf's is having a gift card event from April 18-22, where if you purchase above $500 you will get a $75 gift card, and over $1000 will get you a $200 gift card. Pre-sales start today, so if you had anything else on your wishlist it'll be a great time to add it in. I am so excited about this collection - did you see the LE Meteorites? I love the packaging especially - what did you think of the product? I'm also tempted by the LE Meteorites brush - did you see it, and if so, how is the quality? Hmmm I really love the color of that kohl kajal! I've never used a kajal liner though, and I'm slightly worried it'd smudge on me. It's a pretty color nonetheless! I love guerlain. as soon as I saw the quad I knew I would like it, the swatches look delicious. I am also tempted by the nail polishes. idk if the bronzer is that unique that I have to have it, haha. I hope to see it soon here! I want most of it gahhhhhhhhh. But not the bronzer as I think it's too warm for me. The purple gloss is intriguing; I thought it'd be less pigmented. The collection as a whole is gorgeous, and I see what you mean about being able to take in all the swatches at a single glance. 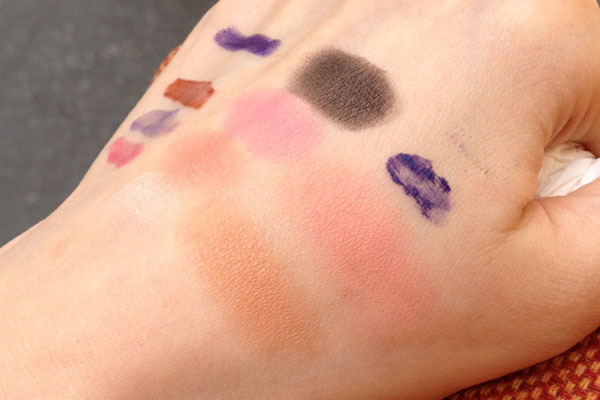 It must require some care and patience to keep the swatches intact until you can get outdoors for natural lighting! I was surprised to see the collection already available (except for the glosses and polishes) on Sephora's website since the middle of last week. Good news for those who don't want to stalk counters. My package should arrive around Wednesday, goody. Ooh, this collection is gorgeous! 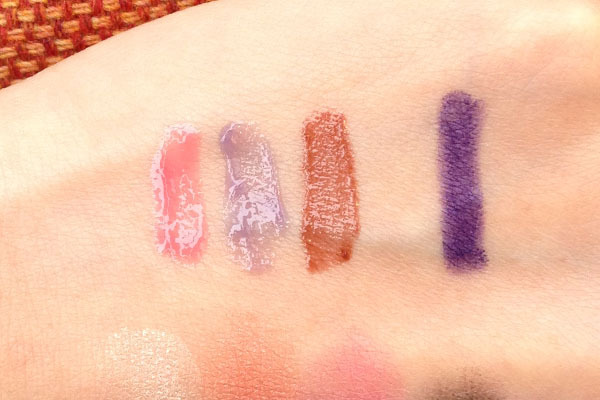 I love that purple gloss, and the eyeshadow quad looks really nice. Emi- I'm not keen on the brush, honestly, but that's to be expected for an LE brush. It's more a collector's item than of much use. Claire- I think the nail polishes look great (though I haven't tried it on nail) but I don't find the colors very special. leigh- It's not really pigmented. It sort of just deepens your lip color, like Dior's rock coat but for lips. Haha, I ran out of the store to snap pictures because I knew the sun was setting! The blue gloss. I need to see it on you! Hmmm . 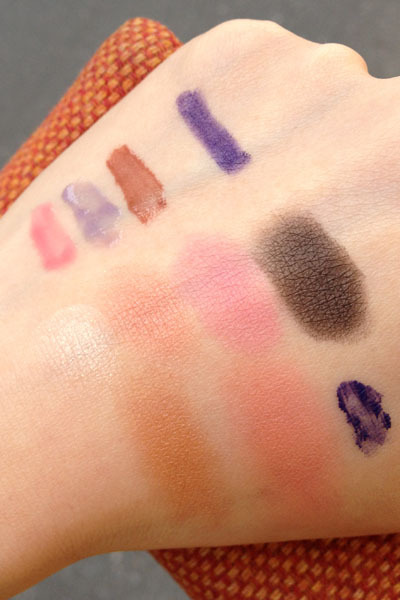 . . Guerlain describes the Khôl, mascara, and gloss as blue and previous blog swatches I've seen look blue. You're describing them as purple and they do, indeed, look decidedly purple. 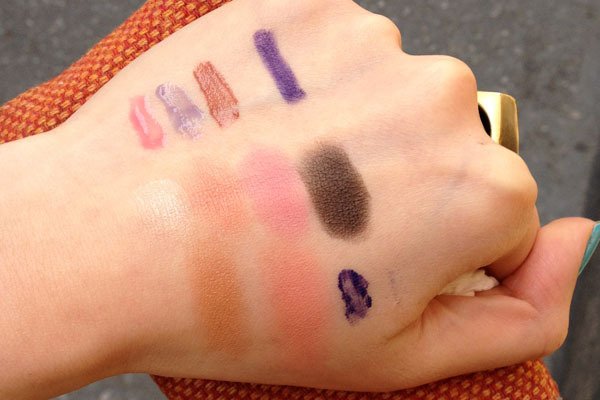 I know it's not your camera or my computer screen because all your other swatches look exactly as I've previously seen them. Do you think it's a skin tone thing or are these colors on the border between navy and purple in which case they'd have a chameleon like quality? Although I pre-ordered a number of things from the collection, I gave all the blue (purple?) items a miss until I could actually see them at the counter.